Tonight I decided to make some no bake cookies. 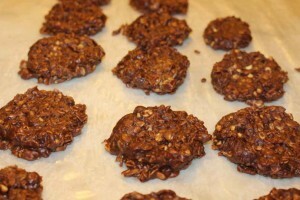 When I was a child my mother made these cookies, calling them Chocolate Oatmeal Cookies. Since I am making them for the Seminary students who meet in our home at 6 AM on weekdays, I am thinking these cookies are sort of like cereal…aren’t they?! Place a longish length of waxed paper on a clean counter. I had just washed the counter so it was somewhat damp. The paper stuck to it beautifully. If you don’t have a counter handy, you can put the waxed paper, or parchment paper, on a cookie sheet. Put the oatmeal in a large bowl. Plop in the peanut butter on top of the oatmeal. Using a medium-sized saucepan, bring the sugar, milk, butter and cocoa to a boil over medium heat, stirring occasionally. When the sugar mixture begins a full rolling boil, let boil for 1 minute by the clock. Remove from the heat.Immediately pour the hot sugar mixture over the oatmeal and peanut butter as well as the vanilla and salt if you remembered. Stir well with a long handled wooden spoon until well-combined. Using a portion scoop, scoop out the mixture and place it onto the waxed paper on the counter or baking sheet. Let sit at room temperature until cooled and hardened. This takes about 30 minutes. Refrigerate in an airtight container for up to 3 days. Because I used a two-tablespoon portion scoop, this batch made about 24 cookies, but it is hard to know since someone came by and helped himself before I counted…! These are not his first choice in cookie. He feels peanut butter belongs on bread with jam. Period. Funny that he was able to choke down one or more of these!